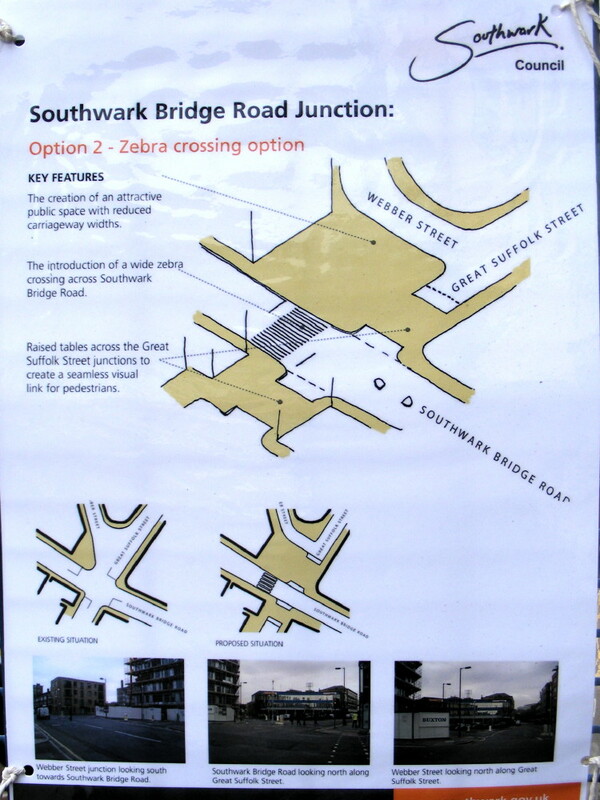 I saw this morning that there are plans to rejig the junction between Great Suffolk Street/Southwark Bridge Road/Webber Street. There are notices up by the junction. Seemed like a good idea - there are two alternative schemes but both include pedestrian crossings of some sort. Hopefully it'll cut down on the number of traffic accidents/near misses as well, as there is going to be more of a chicane to turn into Webber Street and possibly a raised platform there. Are there a great number of traffic accidents on that junction? I walk and ride across it several times a week. I've lived here for 10+ years. I've never seen any accidents, or any near misses. I think I'm very keen on road safety. It's just that I don't think that putting in more junctions/crossings/"calming" schemes is necessarily the answer. I also think that there are a lot of unnecessary crossings/chicanes/etc (viz the crossing on the jctn of Newington Causeway and Harper Rd (between The Ship, The Balti House, and Carpoint). Neither drivers nor pedestrians are inherently stupid. I think that a lot of the current traffic schemes treat them as if they are. I also think that there are a lot of unnecessary crossings/chicanes/etc (viz the crossing on the jctn of Newington Causeway and Harper Rd (between The Ship, The Balti House, and Carpoint). I saw the worst accident I've ever seen (and I mean that) on that junction a few years ago. It involved a motorbike (at least I'm pretty sure that's what it started out as), a lorry and several cars. I have never seen a human in two pieces before or people skewered through and pinned into their cars and I know I never want to again. Whether it was due to the traffic system or human error, I have no idea but now the changes are in place, I can approach that junction with marginally less trepidation than I did before. Yuk what a dreadful thing to witness. I used to cross that road everyday before the changes and it was a nightmare to cross there. Also used to walk past the junction that is being rejigged and again that was not easy especially as then I had young children with me. So i think the improvements were/are necessary. 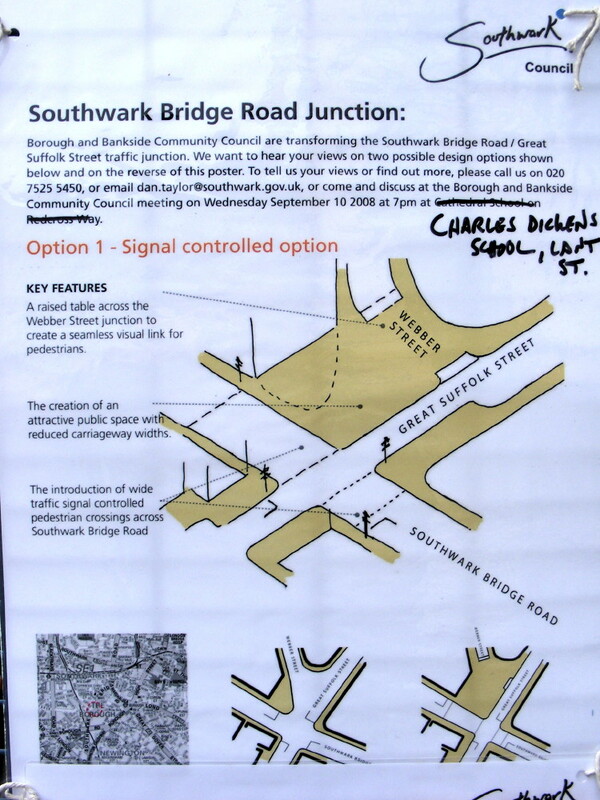 A crossing at the junction of brough road and southwark bridge road wouldn't go amiss either. Undoubtedly a terrible thing to witness. But, I think I'd argue that the changes to that junction (which, basically, operates in just the same way as before, except that there's a prolonged pause - i.e. when there's a red light showing to traffic coming from all directions - between every change of lights) are not designed in any way to stop those type of accidents. I cross the road there twice a day on my way between home and the office and I see vehicle/vehicle near misses perhaps every one or two months (which might equate to quite a large number overall considering I am only actually there a few minutes at a time). There was a man knocked off a scooter earlier this year: http://www.london-se1.co.uk/forum/read/1/88205 and I've seen a cyclist collide (at speed, but thankfully without injury) with a van that turned across him. I have also seen pedestrians have to jump back/forward quite sharpish to avoid cars/vans zooming down Webber Street from Southwark Bridge Road, or motorists having to hit the brakes quite hard. That aspect of the current junction is the main problem - people skipping the lights, or racing to get through the lights and turning right off Southwark Bridge Road into Gt Suffolk St to get into Webber Street end up making the turn into Webber Street at quite a speed. The proposals here seem quite sensible - it doesn't look like it will slow down traffic along the main roads, and vehicles going down Webber Street will end up going at a safer speed. It should also be easier to see if drivers/cyclists are turning into Webber Street or not (at present people generally fail to indicate and it is hard to tell what they're going to do). Accept all your points, but it does sadden me that there are accidents which happen from simple, avoidable, driver error or a driver acting irresponsibly (e.g. running an amber>>red light), and our default way of dealing with it is to redesign the road rather than to deal with the driver. It's like accepting that people will never drive sensibly, and that there's no hope of trying to coerce them to do that, so let's just fence everywhere off and put in loads of light-controlled junctions. I was brought up in a culture where you obey the rules of the road. Whether they may inconvenience you personally, or not. This doesn't seem to be the case now, but instead of trying to get people to follow the rules we are redesigning the roads. On a visit to the town where I grew up, recently, I noticed that most of the places where there used to be a roundabout or an ordinary junction had been replaced by traffic lights. I got talking about that in the pub to someone who I later found out was a traffic policeman. Their explanation of the situation was that there wasn't particularly any more traffic around now than there was 20 years ago, but that standards of driving had fallen so low that your average driver couldn't really handle a "complex" junction or a roundabout, and so they'd all been replaced with traffic lights. I'd rather see a concentration on better driving skills (backed up, if necessary, with stricter punishments for breaking driving laws), than trying to deal with it by changing the roads. If some people are prone to run red lights, they will do it whatever shape the junction is. Only difference is that on one of these new "safe" junctions, the pedestrians, or the traffic coming the other way on a green light, will possibly not be as aware of the possiblity of that as they would on the old "dangerous" junctions. my fear is that the road planners, highways departments, etc, will think that they can solve the problem by extending the gaps between the lights on green, so that if someone jumps an amber, they're less likely to hit someone already going on the green the other way. Of course the problem will be when people realise that they have that extra time, and will jump even more amber lights, and red lights, making the situation worse. I agree with Ivanhoe - better/more guidance training for drivers, and maybe making sure people who have passed the driving test do check ups occaisionally and actually re-read the highway once in a while! One of the proposals involved fewer traffic lights - a less regulated junction with a zebra crossing IIRC. I can't find any information about the proposals online unfortunately. I was going to take a closer look at the sign when I pass by this evening. Perhaps the problem is that councils have more money to spend on road improvements (or, in some cases, non-improvements) than the police/dvla have to spend on policing or improving standards? Not sure how the cost/benefit ratio would compare. Compulsory re-tests would be a grand idea - paid for by the driver hence presumably not needing vast amounts of government funding, and presumably the costs to the driver could be mitigated by insurance savings.